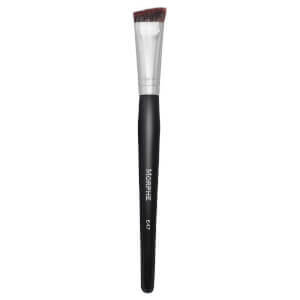 Expertly hide blemishes, dark circles and imperfections with the Morphe M224 Oval Camouflage Brush; an effective tool for creating triangles under the eyes and mapping out cream highlighters and contour products. Topped with a flat, still, oval-shaped brush head crafted from synthetic bristles that don’t absorb product, the Camouflage brush lays down concealer with broad strokes, effortlessly delivering full coverage for a flawless complexion. Darmowy prezent zostanie automatycznie dodany do koszyka. Oferta ważna do wykorzystania zapasów.